Broadway Night is This Week – Spread the Word! Advanced Tickets Now on Sale – Get them before all gone! Buy tickets online at https://southlakeschorus.org/tickets/ now and save money too! 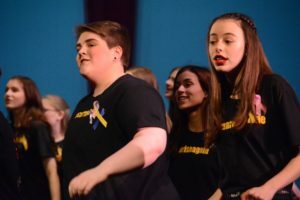 Broadway Night 2019 – this weekend, Feb 1 & 2! We are less than 7 days away from the show! Many thanks to each and every one of you for all of your support, flexibility, cooperation and dedication towards this year’s show. As we enter the final stretch, I wanted to remind everyone that attendance is required at all of the rehearsals moving forward. Please be sure to be attentive to the schedule as it has changed slightly for this week. We have gone above and beyond to honor everyone’s scheduling needs to the absolute best of our abilities. Doodle polling the entire HS cast and making the matrix of every student’s best available times match, with the creative team of director’s availability, has been an insurmountable task on many a day. It is now time for all students to make the schedule work for them as we have come to the point where we must have everyone in order to layer in the rest of the technical components and polish the numbers. I look forward to another week of ‘Broadway bliss’ as everything comes together at the next level! If you have any attendance concerns, send through an Absence Form and discuss with Mrs. G.
Please do NOT email broadwaynight@southlakeschorus.org regarding tardiness or absences. The show is shaping up to be spectacular, but we can only pull it off with help from each participating family. Please sign up for a minimum of four hours volunteering for the show weekend. You can accomplish this with one full show shift, or several smaller shifts. If everyone does their part, then we will each get the chance to sit in the audience for at least one full show. You can slip into the side door and watch your child’s number(s) during many regular work shifts. Start fundraising with Scrip for the Spring Trip! Fundraising for the NY trip is over. Any future earnings will go towards the 2020 spring trip. This all-day a cappella music workshop/show is open to any middle and high school students in the DC Metro Area. Expert teachers and practitioners will teach them to sing and perform in four-part a cappella harmony. The structure is set up for anyone to have a singing experience for the day with a cappella music. All Chorus students, whether they belong to an A Cappella group or not, are encouraged to participate. Either Mrs. G and/or Mrs. McCormick will attend with them, and we can organize school bus transportation. Also, April 5th is a teacher workday, so you won’t be missing class. Talk to each other! Encourage/motivate each other! And do it together! Some members of our A Cappella groups will do a joint venture. So, why not join them? While you can participate individually, you will get coaching if attending as a group! Additional information and tickets can be found at Whiffenpoofs in Alexandria Tickets or at https://www.harmonizers.org/events. If you have not done so yet, please turn them in ASAP.